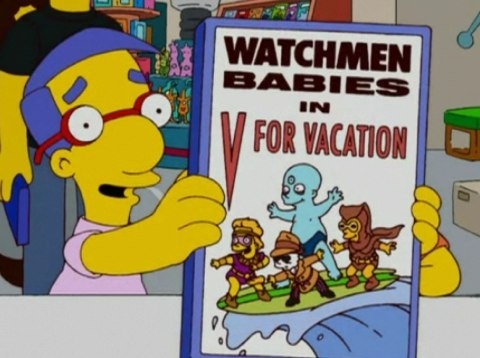 The Quietus | News | Watchmen To Get Teen Makeover? Watchmen To Get Teen Makeover? An apparently real press release, leaked on Friday by TheFilmTalk.com, seems to announce that Warner Bros. are already planning a remake of Watchmen for 2012, even before the film hits cinemas next week. And that's not all! The reboot will cater to the teen market, featuring the acting talents of Robert Pattinson and Kristen Stewart (the couple from 'tween' vampire film Twilight) as Night Owl and Silk Spectre. Dreamy Josh Hartnett will send hearts a flutter as Dr. Manhattan, although one can only assume that the teen version won't include gratuitous shots of his glowing blue shlong. Although this writer was not offended to his core by the modified and somewhat streamlined ending of Snyder's film, the fact that Watchmen is fundamentally an adult story about ageing superheroes could present whatever sorry individual is tasked with realising this a bit of a puzzle. How amazing would it be to see an ironic subversion of the superhero genre subverted back into a completely uncritical superhero flick. If this is for real, and it's a big _if_, it means nothing less than a new era of Hollywood in which studios don't have to wait the obligatory 20 years to cannibalise their old material - they just need to wait for the initial sales to drop off. How crazy would it be if Hollywood made several versions of every film, one for each demographic, like they used to do in the 30s with parallel casts for different languages? So if it's a joke, it's a pretty good piece of satire. If it's not a joke then it will likely have to be passed off as one when Alan Moore's minions storm the building.